Aikahi Park is located along Kalaheo Avenue and Mokapu Blvd. 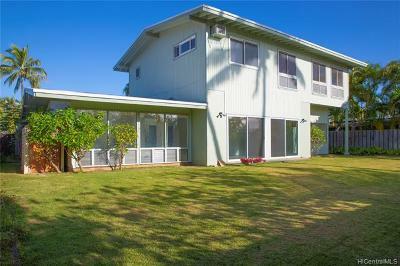 This neighborhood is convenient to the H-3 freeway and Kaneohe Marine Base. Aikahi Park is close to Kailua town. Kaneohe town is just a bit further away in the other direction. Aikahi Park homes were mostly built in the 1960's and 1970's. Occasionally a newer home pops up where an older home was torn down. The average home in Aikahi Park has about 1,500 square feet interior area and 7,000 square feet of land. 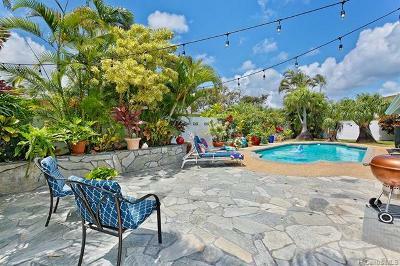 Aikahi Park's lowest priced properties list for around $700,000 and the highest priced homes sell for over $1 million. From downtown Honolulu, take the Pali Highway (61) to Kailua. Proceed straight into Kailua town and to the end of the street. At the intersection, take a left turn onto North Kalaheo Avenue. Drive about a mile, over the bridge and past Pinky's. At the intersection of North Kalaheo Avenue and Mokapu Blvd, either proceed straight ahead or make a right turn, depending on which part Aikahi Park you're visiting. If you're near the Honolulu Airport, just hop on the H-3 freeway to the windward side. Take the Kaneohe Bay Drive exit. Take a right turn (east) from the exit and you're heading to Aikahi Park. You might also want to take a break at the Aikahi Park Shopping Center. The center features stores such as Safeway, Sizzler, a gas station and banks. Tamura's recently opened a store at Aikahi Park Shopping Center. Tamura's is a wine retailer with a great selection! 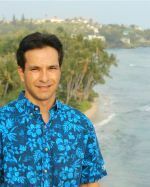 Visit our sellers page and see how Mike will sell your Aikahi Park home with high tech tools and personalized service. An airfield called The Kailua Sky Ranch was once located approximately where the Aikahi Park Shopping Center and a portion of Aikahi Loop are now. The terminal consisted of a Quonset hut and a hangar. Built after World War 2, it lasted until the early 1960's until residential and commercial development took over. 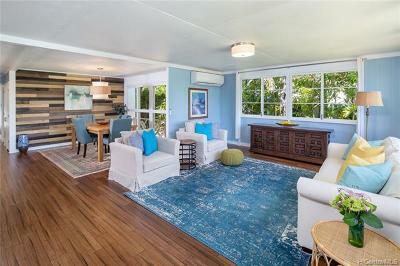 Coconut Grove homes are just down the street from Aikahi Park.